Congratulations! You have decided to build a new timber frame home. There are several preparations you need to complete prior to investing funds, and beginning the design process by entering into a design agreement with a timber frame company or an architectural firm. Being organized will make the process smoother and will save you time, money and aggravation. Try to start the design process a year before you intend to break ground on your project. Manufacturers and builders may be booked for 3-12 months or more. The actual building of your new home could take 6-12 months on average, if you hire a general contractor or builder. Timber frame homes can have completed costs ranging from $100 to over $300 per square foot mainly depending on your local construction costs. Our package cost does not differ no matter where you decide to build. If you plan on hiring a local general contractor, we suggest interviewing 3-5 contractors, asking each of them what their local conventional construction costs are per square foot. You can average their answers to get an idea of what your budget needs to be in relation to the size of the home you want to build. Timber frame homes usually cost 5%-10% more then conventionally constructed homes. The labor costs will be less but the material costs will be more. This indicates that your timber frame home retains a higher value than a conventionally framed home. Please remember that Hampshire Timber Frame homes require less maintenance, are more beautiful as well as stronger, safer, quieter and energy efficient than most conventionally built homes. We build homes to be lived in for hundreds of years, not dozens. These important attributes add value to every Hampshire Timber Frame home. One of the most important decisions will be your first decision; Who is going to design your home? Architects are fine, but are expensive, and most are not familiar with timber framing. Architects may need to be educated thoroughly in the structural engineering and design benefits of timber framing. This will cost you time and money. Please remember that Hampshire Timber Frame will credit your design deposit towards your contract. Many timber frame companies have in-house design services. However, the designer you end up working with may be their salesperson, project coordinator, project manager, draftsman, owner, etc. It is preferable to team up with an experienced architectural designer who has designed and engineered many timber frame homes. At Hampshire Timber Frame you will be working with an experience architectural designer who also happens to be the owner! We are a small company. If you are considering entering into a design agreement with a timber frame/post & beam company, here are a few important questions you need to ask beforehand. Do you hand cut or machine cut your timbers? Can you tell me about the joinery and the sizes of the timbers you normally use? Who will raise the frame and install the Structural Insulated Panels (SIPs)? Who will I be working with in the design of my new home? Will my design deposit funds be credited to the package contract? What makes your company better than all the other companies? Please contact us at your convenience and we will send you more information and a more extensive list of questions to use in interviewing a timber frame or post & beam company. The initial design that you will be working on with your designer is called a "preliminary set of plans". This preliminary set of plans is all you will need to receive bids and apply for financing and permits. For a complete list of drawings Hampshire Timber Frame can supply, see our Design Services page. A cross-section drawing through the main structure displaying: the main stairway (if any), the foundation system, floor system, wall & roof systems and showing the roof eave and rake overhang detail. Every timber frame company says that they have the best products and services and that you should pick them to work with. So, how do you choose your timber frame company? The more you research and understand about timber framing, the better you will be prepared to ask the tough questions like “What makes their company better than all the other companies?” Then there are phone calls to make, emails to send, meetings to have and maybe some homes to visit. A good place to start gathering information is the internet and at log and timber frame home trade shows. These resources will help you develop a short list of potential companies to work with. You should contact each company and talk with the architectural designer/project manager you will be working with throughout the project. These conversations will give you a sense if they are on the same page as you, have the knowledge and experience you require and will be pleasant to work with. After talking with a few companies, you should be getting pretty good at the interviewing process. You may want to call more than once with questions, concerns and to ascertain if they are truly interested in your project. Please check out each company’s policies, products and timber frame joinery details & quality completely. If you have sketches or are considering one of their standard designs, ask them to provide a quote. Inform them of the specifications you require that apply to the products that are included in their standard package. Reviewing the companies’ quotes will give you a good idea of their pricing as well as their organization. A well written quote should define each option completely, be well organized, easy to read, and have a fair price. Estimated costs for installation and trucking should also be included. After interacting with timber frame companies and evaluating their quality, prices and value, one company will stand out as being right for you. We hope that company is Hampshire Timber Frame. To start with, you should have choices of timber species, such as Kiln Dried Douglas fir, Oak, Eastern White Pine or Hemlock and choices of timber surface finishes like hand-hewn or planed-smooth for coating with Tung oil. You should also have choices of timber edge finishes such as a rounded bead chamfer or a flat 45 degree angled chamfer. What about the style of the timber frame itself? Most of the time, the layout of the home will dictate what frame style works best. It may be a common-rafter system or one of many bent systems. 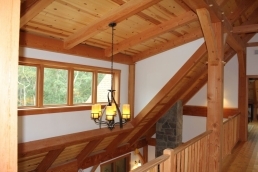 These options will define the look and feel of your timber frame home. Your architectural designer should be able to explain what works, what doesn’t and why. The more you understand, the more comfortable you will feel and the closer the project will come to fulfilling your vision. You should always have the option of incorporating custom frame designs into your home. Please take the time to learn all you can about each component of the package that are listed in your contract. It is highly unlikely that any two timber frame company’s contract include the same items in their quotes and or contracts. To accomplish the highest quality installation, the timber frame structure along with the T&G ceilings and the application of the structural insulated panels should be performed by the same crew that cut the timber frame. This timber framing crew will know the structure inside and out and should accomplish the installations quicker, smoother and accurately. They will not be able to blame the guys in the shop, they are the guys in the shop. This will place all the responsibility of a quality cut and raised timber frame onto one crew. Most of the interior material options will be reviewed and supplied by your general contractor. Floor and wall finishes, moldings, stairways, cabinets and fixtures such as doors and hardware. The heating/cooling system, plumbing and the electrical layout will need more attention. Since most timber frames are built with Structural Insulated Panel (SIP) walls and roof, they tend to be very air tight, energy efficient homes. Therefore, the heating/cooling system needs to be adjusted for a structure in which the only thermal/air breaks tend to be windows and doors. Because of the tightness of these panelized homes, air-exchanger systems are highly recommended. A humidifying system may also be needed for a few reasons. Humidity control will make the home more comfortable, healthier and will save you money on heating and cooling. Humidity control will also assist in the slow drying of the timbers, keeping the frame stable. It is a good idea to review the electrical, telecommunications and audio/video wire layouts for every room of the home. The kitchen may be the most important electrical layout in the home since lighting and appliance locations help create a safe, efficient and enjoyable kitchen. The outside of your home creates the first impression for you each time you return home, and for visitors. It is very important for you to have options of different sidings, trim, windows and roofing, in both materials and style to create this important first impression. The appearance of these options on your home can be represented on the drawings, but their costs and any maintenance they may require cannot. Therefore, learning about the warranties and the maintenance required on all your choices is necessary. Hampshire Timber Frame offers real Cedar, Hemlock, Pine or Cement siding and trim, unfinished or pre-stained to your liking with stains that feature a 15-year warranty. We offer all siding styles such as clapboards, shingles, vertical tongue & groove, shiplap and board & batten siding. Hampshire Timber Frame is a distributor of Kolbe & Kolbe windows and doors made in Wausau, WI USA, which are among the highest quality windows and doors in the industry today. Kolbe & Kolbe windows and doors are available in a “Classic Series” (4 color, 20 yr. warrantee) and in an “Ultra Series” (32 colors, 30 yr. warrantee) with all standard opening types. Kolbe also has many trim styles & hardware options to choose from. 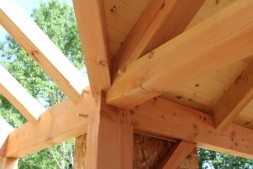 The general contractor does not need to have experience with timber frames in order to perform finish-work on one. If you decide to hire a general contractor and not act as your own, you should obtain at least three estimates from different contractors for your project. Contractors will require sets of plans for any in-depth project discussions, and to develop accurate pricing estimates for you. Their enthusiasm and confidence of being involved in the construction of a Timber frame structure is very important. Try to hire a contractor who is a member of the National Association of Home Builders, is insured, has a stable business record, supplies you with a competitive bid, guarantees their work will be completed in a timely, efficient manner, and who offers a warranty on both their building materials and craftsmanship. Try to review samples of their work and interview past clients to assess their level of satisfaction. Questions you may want to ask their references include: Did they finish within budget and on time? Were there any surprises? How did they handle changes? Were they easy to work with? Would you use them again? Did they hire subcontractors? What didn’t you like about them? Scheduling may be an issue, so please discuss it with all parties involved. Contact your local building department and let them know your plans. You will then know the timing and process of acquiring the proper permits. Early contact will help keep the building process smooth and avoid surprises. They should inform you about all the code restrictions and ordinances you will have to comply with, such as: the necessity of having a registered structural engineer’s stamp on your drawings, property/lot setbacks, height restrictions, road closings and bridge weight loads. Please review the building permit application for requirements, conditions and expiration. Find out what conditions need to be met to receive a certificate of occupancy, as you may want to move in as soon as possible and perform some finishing labor yourself. Take your time. You will know when you are ready. And when you are, we hope to hear from you.